I was reading a story today on Foxnews titled: “could guided bullets turn an average joe into a sniper?” The article is written by a former ballerina turned “defense specialist” (I didn’t make that up). I have written about this subject before in “The Carpenter Not The Hammer Builds the House”. In short, her article suggests that new, more accurate bullets could turn an “average joe” into a sniper. The referenced article on bullets demonstrates several major flaws in thinking about security or defense. First, it quotes a “specialist” who has no specialized knowledge of the subject gained through actual experience. I am not doubting that Ms. Barrie has read some great books and attended great lectures but the fact remains that without real world experience, it is difficult to understand how she is qualified to speak on the subject at hand. We see this in many areas of security from information to physical and so on. The second issue is one I see every day. It is the mistaken belief that the technology makes the expert. It discounts the knowledge, training and practice required to use the ‘tool’ with effect. If I were to buy a Formula 1 racecar would I suddenly be considered a ‘racer’? A more accurate rifle does not make a sniper…it simply makes a sniper more accurate. Within information security we see the same flawed logic. Companies believe that by purchasing the latest and greatest technology they can replace expertise gained through years of work ‘in the trenches’. A leading application layer firewall is only as effective as the person deploying, configuring and managing the device. The moral of the story? Technology makes experts more effective they do not create or establish expertise. 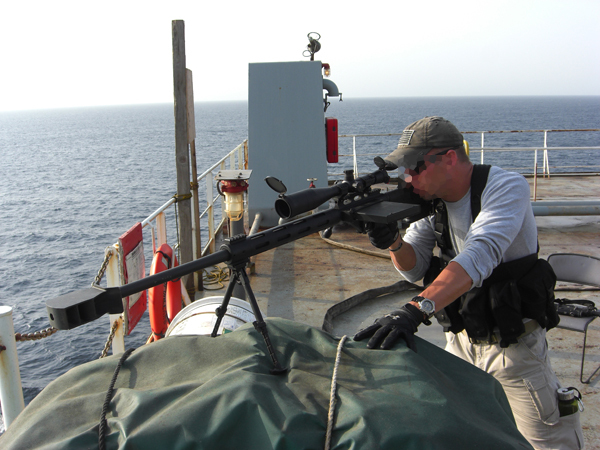 BTW: the picture is a Canadian Sea Marshal Tactical Team (CSMTT) sniper on a ship.